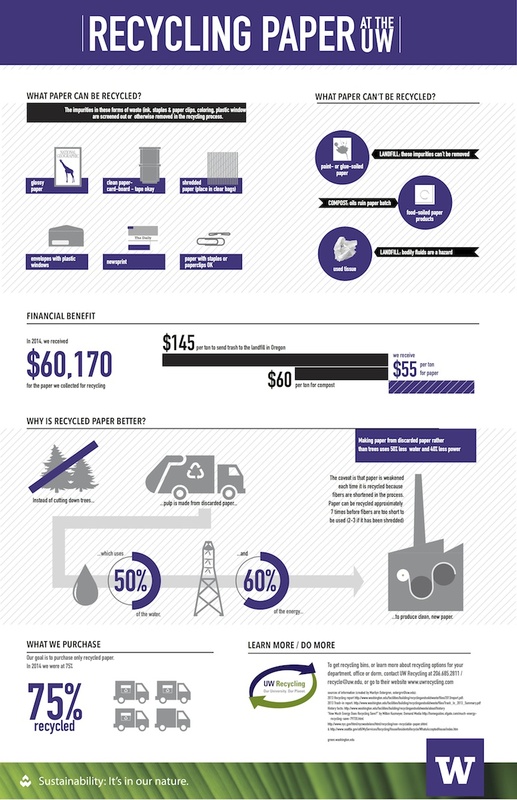 Increase recycling of all paper products and 100% of all copy and print paper. It's the law! 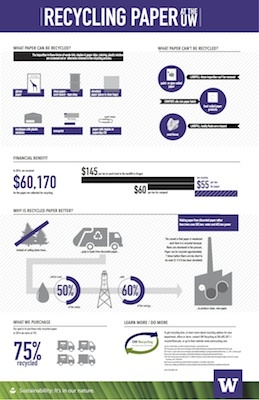 In 2009, the Washington State Legislature passed Substitute House Bill 2287, directing all state agencies, including the University of Washington, to develop a paper conservation and recycling program; to purchase 100% recycled paper for office copiers and printers by December 31, 2009; and to reduce paper consumption by 30%. It can save your department money! Switching to double-sided printing, investing in laptops and projects instead of note-taking and printing presentations on paper and generally reducing printing and copy volume will cut down on paper and toner costs and save money in the long run. It's good for our environment! The University of Washington is a local, regional and national leader in sustainability with a dedicated investment in the environment. 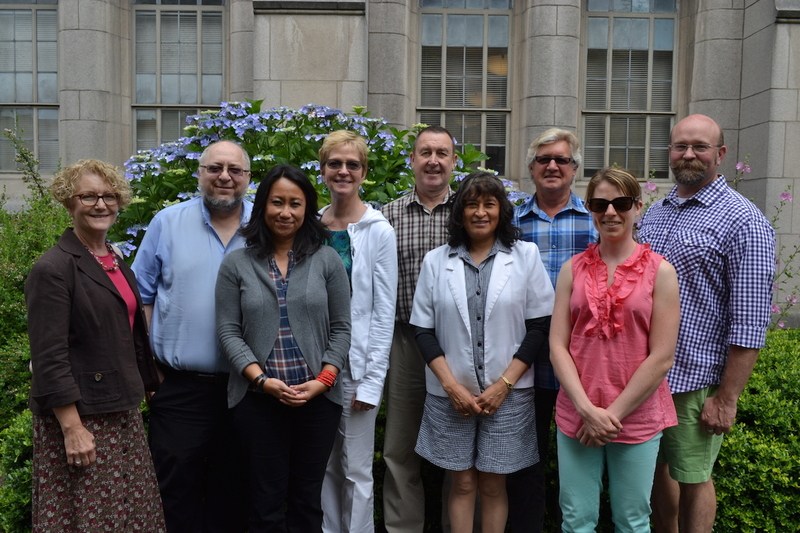 Our practices reflect our values as we celebrate our campus and community, and we invite you to celebrate with us by implementing more sustainable practices into your work. 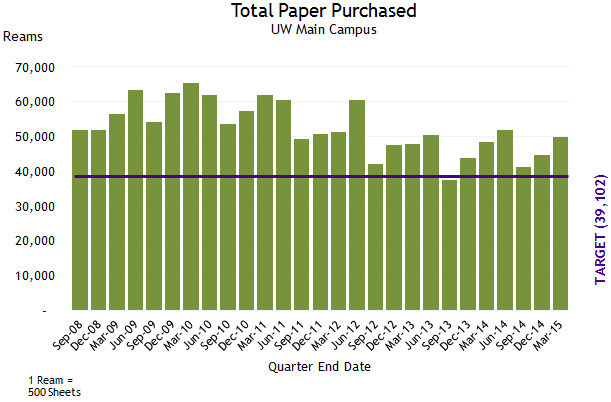 UW's Paper Reduction is a Transforming Administration Program project. Paper Reduction Pros is a program that gives recognition to those who make significant and conscious efforts to considerably reduce the amount of paper they use, as well as people who educate their peers in paper reduction. Learn more and take the pledge today! The Green Office Certification program has several resources and tips for paper conservation. a sustainable service offered by an external supplier, Ricoh, to improve the way we copy and print documents, resulting in a reduction of paper consumption and can save departments up to 25% over current costs. enables individuals or groups to send and receive faxes without maintaining a physical fax machine. Rather than having faxes print out, faxes are sent or received using email or by accessing a simple-to-use web page. a service offered by Mailing Services for departments experiencing a lot of unwanted mail from former staff members that would like to reduce and eliminate a lot of that waste. 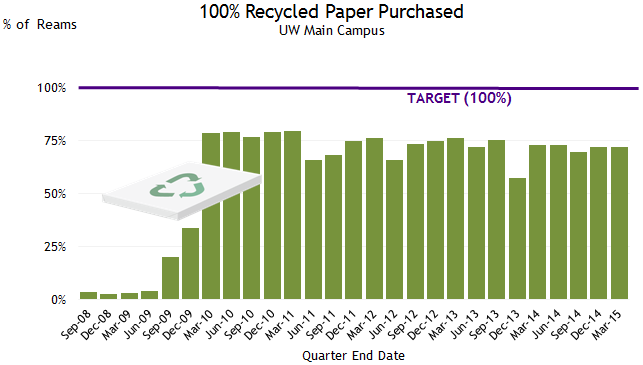 If you have ideas or best practices, contact us at sustainability@uw.edu. 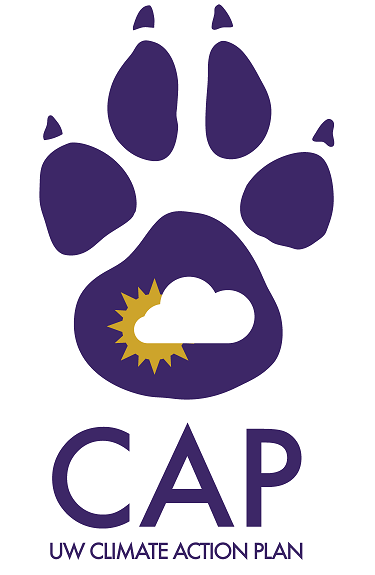 The Climate Action Plan calls for education and outreach programs for faculty staff and students in regard to using and purchasing of goods and printing and copying responsibly (Strategy 7.4.2), and outlines a purchasing policy for products made with post-consumer recycled content products (Strategy 7.4.3). The Paper Conservation Program supports these strategies.